Are you ready for the greatest changes in recent human history? Futurism meets humanism in Gerd Leonhard’s ground-breaking new work of critical observation, discussing the multiple Megashifts that will radically alter not just our society and economy but our values and our biology. Wherever you stand on the scale between technomania and nostalgia for a lost world, this is a book to challenge, provoke, warn and inspire. From two decades of traveling the world and speaking about future scenarios across many industries and cultures, Futurist Gerd Leonhard has acquired unique foresights and intuition into where the world is rapidly going. As technology develops at an exponential pace and redefines the way we work, live and even think, he explores the myriad unasked questions we should have been posing some time ago. If you are a business leader, an institutional decision maker, a professional in any industry or simply a curious and aware individual, this book challenges and inspires you to take stock and rethink your humanity in the post-human world. Technology vs. Humanity is a last-minute wake up call to take part in the most important conversation humanity may ever have. Will we blindly outsource and abdicate big chunks of our lives to the global technology companies – or will we take back our autonomy and demand a sustainable balance between technology and humanity? By supplying a Socratic and humanistic critique of the Megashifts currently recasting our world, Gerd Leonhard provides the prologue for this great debate. Now is the time to join the dots between big data and digital ethics, to start discussing the moral framework required to steer the evolution of digital life – and to finally articulate the difference between our unique humanity and the rapidly evolving robotic versions. In 1949 George Orwell released Nineteen Eighty-Four – offering us a stark warning of a world dominated by technology and those who own and control it. 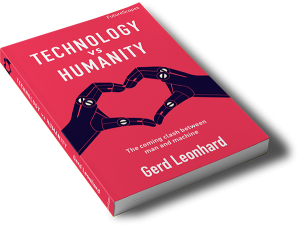 Nearly seventy years after its publication, Gerd Leonhard investigates how we preserve our humanity in a world that is rapidly beginning to resemble that science fiction. Looking to book Gerd for a keynote or presentation? "Gerd Leonhard is most definitely a member of Team Human. Here's his convincing and heartfelt call for the reinstatement of people and purpose into the technology program." "Our world is transforming at breakneck pace. Gerd is raising the central most important question of the century: what will our ethics be? His book can help us choose the path of a beautiful and rich future and avoid the path where that future – by virtue of billions of unconscious non-decisions – has impoverished our lives beyond repair"
"A brave manifesto for a more human world." Andrew Keen - Author of "The Internet is not the answer"
"Gerd Leonhard provides a fascinating look at the impact of exponential technologies and the dilemmas we will face in adapting to—or being adapted by—these. His book really makes you worry—and think." "Gerd Leonhard zeroes in on some of the most vexing worries about our coming age of mechanically-enhanced thought. Are there "win-win" ways to gain the advantages without sacrificing our humanity? Can we bio-minds teach the newer kind ethics? Or love?" David Brin - Author of "Earth and Existence". "As we head into the exponential, smart machine -enabled and exciting future we need to critically ponder the big new questions that this new era raises. Gerd artfully takes us on a journey of discovery of our new challenge. This book is a must read for any leader... In any position, anywhere!" A highly sought-after keynoter and change guru, Gerd Leonhard is also an acclaimed author of futurist manifestos as well as an accomplished creator of future film and media content. Gerd travels the globe year after year, refining his cross-sector awareness and transferring the secrets of successful evolution from one arena to the next. Together with his handpicked team of creatives and designers, Gerd enables his clients to futurize their business from leadership and strategy to innovation and culture. The Futures Agency is a newly reformed unit that supplies the ideas, the events and the content to realize the client’s most promising future. Born in Bonn and resident in Zurich as well as San Francisco, Gerd is a global citizen of the future who spends his life travelling through global meetings and conventions on transformational change. A star speaker on topics of major strategic import – from digital disruption to business remodeling to specific vertical scenarios across public and private sectors, Gerd is a rare hybrid of artist and scientist with a pioneering background in digital music ecosystems and a head start in the disruption game. For the last fifteen years he has been the first choice in business leaders’ minds for inspirational and paradigm-shifting advice.